Update May 2018: Spypig seems to be down or temporary unavailable. Here are some sites like Spypig which you can use as an alternative. I will notify you on our Facebook page when Spypig will be up and available. Email is one of the most preferred communication and as we say online, Email works better than Facebook message or any other social networking message system. One reason why I always prefer SMS over Emails because we get report delivery for SMS but report delivery for Email is something which I always miss. I wish if services like gMail, Yahoo adds this feature by default. Thanks to free Email read receipt sending services like whoreadme, Readnotify, SpyPig and so on. Today, we will look into one of such service and how you can use to get Email notification when people open it. Ever wondered if your email was read by the recipient or not? Wanted to find out if that long email love letter that you sent to your love was actually read by her or just trashed? There is a simple way to track your email and find out if it was read by the recipient. I know, it sounds creepy, but a lot of people do secretly want to know that information. Even for official purpose, sometime it’s important to know if receiver received the email and opened it or not, and at times this turns out to be a real life-saver. SpyPig is one such online tool that you can use to track your emails, & receive Email Read Receipt, which tells you if your email is still unopened or opened by the receiver. So, you must be wondering what SpyPig is and how it works. Well, I’m going to be telling you that in the following lines. When you send an email, you can add Spypig’s email tracking system to it and you will receive email read receipt. Yes, this is a form of spying, but I’m sure you’d need this one day or another. The tool works with almost all of the email clients and is very easy to use. It has no spyware, adware or anything of that sorts and is pretty clean. There is nothing to download and install, it all works on the internet and can be done while composing your email. The tracking is done with the help of a special image created just for your email address. You’ll have to give in your email id, and a message title on the Spypig website and your tracking image will be created instantly. That’s how the email is tracked. Below is a step by step tutorial on how to get the tracking image for your email address. Learn: How to Schedule Email in Gmail? How to use SpyPig to get Email read receipt notification? The first step, obviously, is launching the website www.spypig.com. Once you’re on the website, navigate down to find the section titled SpyPig Factory. 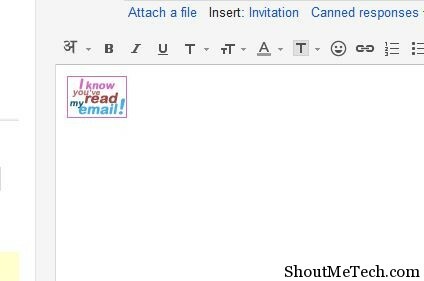 Fill in your details such as Email address that you’re going to use to send the email and an appropriate title for it. Now, select an image from the ones that are available or you can even upload your own custom image. The included images contain one blank image, three images with a Pigs face and one that reads ‘ I know you’ve read my email! ‘. 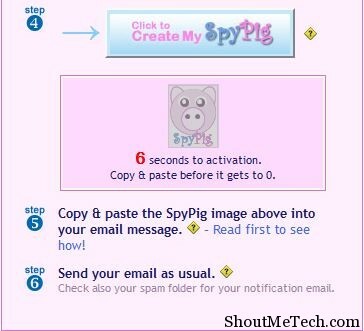 Click on Create my SpyPig and wait few seconds until your see your image pop-up in the box below. Send your email and wait for the notification email to arrive. You see how simple that was? That’s it! You will now receive a notification email that will tell if you’re email has been read or not. Some things that Gmail users should keep in mind; you may get an instant notification from Gmail about the email, so just ignore the first one. Another important thing to remember is, that you must have enable HTML emails for this to work properly. That’s basically how you can spy on your friends and others who pretend to have not read your email. In all the options of adding images from Spypig, I like the blank one as it works like stealth Email tracker and receiver will not even notice if there is any such tracking script added to it. More over, when you receive Email read receipt from Spy pig, it will give more details like which browser was used, I.P of the Email opener. In the free version, it’s limited to 5 Email per tracking. There are a lot of people who believe that SpyPig is just something wrong and shouldn’t exist, so tell us what you think of this tool. Is it wrong or is it useful? 1.1 How to use SpyPig to get Email read receipt notification?